Coffee is an extremely popular drink, not only in the United States but around the world. The collective thirst for coffee has grown over the past few decades, due—at least in part—to the success of Starbucks, which has more than 28,000 stores worldwide. In the past, coffee was consumed mostly in relationship to meals; people now enjoy their java around the clock, with or without food, often as a dessert or iced beverage. All told, the world consumes 1.4 billion cups of coffee a day, with the highest consumption being in Europe. With such a large amount of coffee being consumed, it would seem likely that many people would experience allergic reactions as a result of drinking coffee. The reality, however, is that you're probably at very little risk for being allergic to your morning (or afternoon or evening) cup of Joe. Indeed, there's surprisingly little information in the medical literature regarding allergic reactions to drinking coffee. One report from Italy, published in 2008, described a father and daughter who experienced a presumed coffee allergy after contracting a parasitic infection. The authors theorize that the parasite damaged the intestine and allowed the development of a coffee allergy to occur. Both father and daughter showed evidence of specific antibodies to coffee with positive blood testing and skin testing, and symptoms of hives and diarrhea occurred when drinking coffee and resolved when coffee was avoided. The risk of developing a coffee allergy is more likely for workers at coffee roasting and packaging facilities. The first reports of occupational allergy to coffee date back to the 1950s and 1960s, when workers at coffee production plants began to experience symptoms of nasal allergies and asthma with exposure to raw (green) coffee beans and roasted coffee dust. These incidents suggested that coffee allergens, which were isolated in 2012, survived the roasting process, possibly putting coffee drinkers at risk of allergies. This doesn't seem to be the case, however. As one editorial explains, the problem appears to be unique to workers at manufacturing plants, where sensitization occurs with coffee bean dust, which can be released throughout the entire plant, via inhalation or contact with the skin. Drinking coffee doesn't seem to pose the same problem. In fact, when a group of 17 coffee plant workers who complained of nasal allergies as a result of exposure to coffee dust was studied, none of them experienced any reaction with drinking coffee. One possible explanation is that coffee actually prevents allergy development, which was the finding of research in animal studies. There are a number of reports of people being allergic to caffeine, with symptoms ranging from hives to severe anaphylaxis. 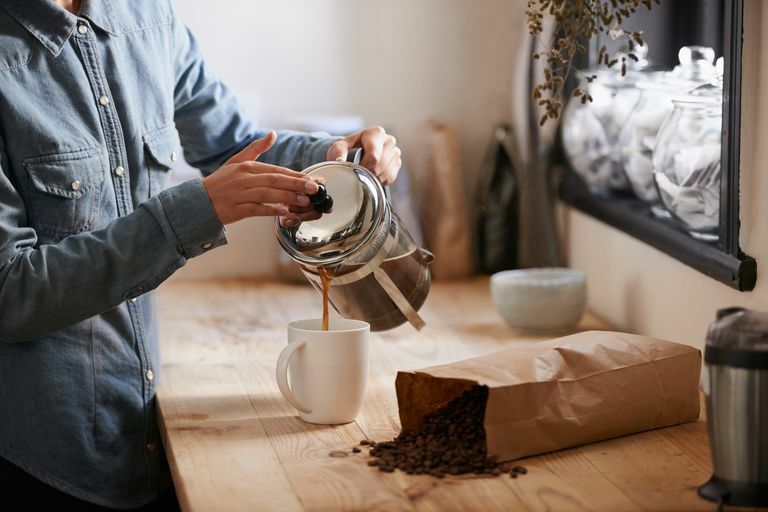 However, most people who experience symptoms after drinking coffee, such as headaches, rapid heart rate, gastrointestinal upset (such as nausea or diarrhea), jitteriness, and insomnia, are having either a non-allergic food intolerance or pharmacologic side effects from the caffeine in the coffee. People who think they have a coffee allergy should consider the possibility that they have a caffeine allergy instead. One way to know for sure is to switch to decaffeinated coffee. If you have allergy symptoms after drinking decaf, you might be allergic to coffee. If you have symptoms after drinking other caffeinated beverages, such as cold, tea, or chocolate, you more likely have a caffeine allergy. Manavski N, et al. Identification, Expression and Immunoreactivity of the First Coffee Allergen. Int Arch Allergy Immunol. 2012;159:235-42. Is It Possible to Have an Allergy to Band-Aids and Other Adhesives?